Richard A. Taylor. Interpreting Apocalyptic Literature: An Exegetical Handbook (Handbooks for Old Testament Exegesis). Grand Rapids, MI: Kregel Academic, 2016. 208 pp. $21.99. Interpreting Apocalyptic Literature is the latest volume from Kregel Academic’s Handbooks for Old Testament Exegesis series, which offers a basic introduction to exegesis and proclamation of different genres of OT texts. The purpose of this volume is fourfold: to 1) provide an introduction to Second Temple Jewish apocalyptic literature; 2) situate OT apocalyptic literature within the context of ancient apocalyptic thought; 3) provide guidelines for interpreting this genre; and 4) provide a sample treatment of two OT apocalyptic texts. Chapter 1 provides an introduction to apocalyptic literature, addressing renewed scholarly interest in this genre (with a note on Kasemann), distinguishing helpfully between apocalypse, apocalypticism, and apocalyptic literature, tracing the development of Jewish apocalyptic literature, and sketching the social world behind the literature. Chapter 2 addresses major themes in apocalyptic literature, dealing with major texts and then the genre as a whole. For Old Testament Prophets, a bit more attention is devoted to Daniel than the rest of the texts (which makes sense given the scope and aims of this book), summarizing its message, purpose, major themes, and structure. Then quick overviews are provided for Isaiah, Ezekiel, Zechariah, Joel, Malachi. For extrabiblical texts, a brief introduction to types of apocalypses is first provided before surveying each of the five parts of 1 Enoch, then 2 Enoch, Jubilees, 4 Ezra, 2 Baruch, Apocalypse of Abraham, Testament of Levi, Testament of Abraham, Apocalypse of Zephaniah, and Testament of Moses. Then Taylor addresses the question of whether Qumran was an apocalyptic community and surveys a few DSS texts with apocalyptic elements (Community Rule, War Scroll, and New Jerusalem. Chapter 2 concludes with some general characteristic features (revelatory content, dreams and visions, pseudonymous authorship, hiddenness and secrecy, and pervasive symbolism) and major themes (developed angelology, ethical dualism, deterministic outlook, imminent crisis, faithful remnant, divine judgment, and eschatological hope) of the genre of apocalyptic literature. Chapter 3 focuses on the book of Daniel (since it contains the only true apocalypse in the OT) to address the issue of how to prepare to interpret apocalyptic texts, noting key exegetical procedures and tools . Taylor covers figurative language, reception history, the issue of bilingualism in Daniel and textual criticism,working with original languages, and benefiting previous scholarship. He provides an annotated bibliography of OT textual criticism, Bible software, lexical resources, grammatical resources for Hebrew as well as Aramaic, and primary and secondary sources for the study of apocalyptic literature. In chapters 4 and 5 Taylor addresses guidelines for interpreting and proclaiming apocalyptic literature, respectively. Finally, Chapter 6 models the process that has been taught in the rest of the book by working through Daniel 8:1-27 and Joel 2:28-32. Interpreting Apocalyptic Literature is an excellent guide to exegeting and preaching apocalyptic (and proto-apocalyptic) OT texts. It provides a valuable (albeit brief) introduction to the genre and sketches the Second Temple Jewish context, situating OT apocalyptic literature within the broader world in which it was birthed. I think this would be a great text for upper level bible college and introductory seminary OT courses. It would also be a great resource for self-learners unfamiliar with the genre (for whom the annotated bibliographies in chapter 3 would be particularly valuable), especially those with regular opportunities to preach. Frank J. Matera. New Testament Theology: Exploring Diversity and Unity. Louisville, KY: Westminster John Knox Press, 2007. 520 pp. $55.00. Frank Matera is a prolific Roman Catholic New Testament scholar who had published books on NT ethics and Christology prior to this New Testament theology (hereafter “NTT”). He conceives of NTT as a specifically theological task and feels that history of Christian religion should be a separate discipline. Matera further contends that for those who see the NT as inspired Scripture, the presupposed internal coherence should be seen in how we carry out the task of NTT – that is, NTT should display the unity of the writings while doing justice to the diversity. This is a primary aim of Matera’s NTT, as made plain by the book’s subtitle and throughout the introduction. His method of achieving this aim is by taking into account the implied narrative of Scripture. Matera’s NTT takes an author-by-author approach, with the book broken into the three great voices (Synoptic tradition, Pauline tradition, Johannine tradition) plus “other voices.” He sees the distinctive starting points of the three great traditions as the key to their diverse theologies – the Synoptics in Jesus’s proclamation of the Kingdom of God, the Pauline in the gospel of what God has accomplished in the death and resurrection of Jesus, and the Johannine in the incarnation. He puts the Acts of the Apostles in the Synoptic tradition and presents the books in the order of Mark, Matthew, Luke-Acts in order to show the development in the Synoptic Gospels as well as “how Luke envisions the transition from the preaching of Jesus about the kingdom of God to the proclamation of the early church about its risen Lord” (1). For the Pauline tradition, Matera deals with all 13 letters together; although he believes some to be deuteropauline, he sees the canonical letters as together forming a Pauline tradition that originated with the Apostle Paul. Because Matera’s goal is not to construct a historical account of Paul’s theology but to construct a theology of the canonical Pauline corpus, methodologically he doesn’t need to distinguish between the undisputed and disputed Paulines. However, I think bringing up the authorship issue but not saying more about it will incite questions from both the conservative and critical. Matera organizes the Pauline tradition into five groups, each with its own focus: (1) the Thessalonian correspondence in light of its election theology; (2) the Corinthian correspondence in light of its theology of the cross and the resurrection of the dead; (3) Galatians and Romans in light of their theology of justification by faith apart from during the works of the Mosaic law; (4) Philippians, Philemon, Colossians, and Ephesians in light of the imprisoned apostle’s theology; and (5) the Pastoral Epistles in light of the theology of handing on the Pauline Tradition to a new generation” (102-103). Matera excludes Revelation from the Johannine tradition because of its differing starting point – God’s victory in the slaughtered lamb. I think that even on the basis of starting point Revelation could be placed with the Johannine Gospel and Epistles, and that separating it needs more justification. For example, I think you could make a case for the starting point of Revelation also being the incarnation – in Revelation Jesus is the lamb of God slain before the foundation of the world (Rev 13:8). What Matera notes as the distinct starting point of Revelation as God’s victory in the slaughtered lamb could be tweaked – God’s victory in the incarnate lamb who was slain.Nevertheless, Matera notes that the Gospel and Epistles of John share the common starting point of incarnation, as well as themes such as faith, love, light, and life. He also mentions diffs within this tradition such as genre, theological implications of the incarnation (revelation of Son from the Father in Gospel, communion of believers with God and each other in letters). The “other voices” are Hebrews, James, 1 and 2 Peter, Jude, and Revelation. Matera expounds upon the rich Christology of Jesus as high priest in the order of Melchizedek in Hebrews, the counterbalance to Paul provided by the General Epistles, and the Christology of Jesus as the lamb who was slain and will be victorious in Revelation. These “other voices” share several theological motifs: “(1) the need for conduct that coheres with the gospel, (2) the assurance that there will be a final judgment at which the wicked will be punished and the just rewarded, (3) a conviction that suffering and affliction are part of the Christian life in the time before God’s final victory, (4) warnings that false teachers will appear in the last days, and (5) exhortations for the faithful to persevere and maintain the apostolic teaching they have received” (334). The unity of New Testament theology is grounded in the implied master story to which these writings witness. This story can be summarized in this way: Humanity finds itself in a predicament of its own making from which it cannot extricate itself. This predicament, which is experienced as a profound alienation from God, is the result of humanity’s rebellion against God. It affects Jew and Gentile alike. Because humanity cannot reconcile itself to God or free itself from this predicament, God has graciously sent his own Son into the world to redeem the world. Those who believe and accept this gracious offer of salvation, Jew and Gentile alike, are incorporated into a community of believers that God has redeemed and sanctified through Christ. Redeemed and sanctified, this new community lives by the power of God’s Spirit as it waits for the consummation of all things. Although this consummation is expressed in different ways (the parousia, the general resurrection of the dead, the final judgment), the New Testament writings agree that God will be victorious and Christ will be the agent of God’s victory (427-428). Then the New Testament witness to this narrative is summarized under the headings 1) humanity in need of salvation; 2) the bringer of salvation; 3) the community of the sanctified; 4) the moral life of the sanctified; and 5) the hope of the sanctified. These are basically what we traditionally call anthropology, Christology, ecclesiology, ethics, and eschatology. The conclusion was a bit of a letdown for me. From the introduction I was expecting it to be a synthesis, but it was instead mainly summarizing author-by-author under the aforementioned headings; I did not perceive a satisfactory synthesis of the unity of the NT and NTT. The body of the book also felt most of the time like an NT introduction, with a lot of summarization. However, Matera’s NTT is a good book by a great scholar. It’s provides a solid theological overview to the New Testament that intellectually-minded Christians would benefit greatly from as a robust introduction to the New Testament. It would be a great book in NT intro/theology courses in Bible college courses and perhaps lower-level seminary courses. In preparing to teach/preach through a book of the New Testament, reading the pertinent section from Matera’s NTT would be fruitful. That being said though, it’s not a particularly exciting book, especially if you’ve read other NTTs that pursue a specifically theological task and aim to do justice to the unity of the NT (e.g. Thielman, and especially Marshall). However, for those who have not read an NTT of that type, Matera’s is an excellent representative/choice. Thanks to Westminster John Knox for the review copy! Eugene H. Merrill. A Commentary on 1 & 2 Chronicles (Kregel Exegetical Library). Grand Rapids, MI: Kregel Academic, 2015. 640 pp. $39.99. One-year Bible reading plans that don’t die in Leviticus most likely meet their demise in 1 Chronicles, with its nine opening chapters of genealogies. Preachers don’t often tackle 1 and 2 Chronicles, either. For these very neglected books, Eugene Merrill’s commentary in the Kregel Exegetical Library is a great historical, theological, and exegetical guide for the academically oriented lay-person, preacher. Seminary students, scholars, and higher-level laypeople will probably want a more technical commentary. The 50-page introduction is robust and goes beyond typical introductory issues such as authorship, genre, and historical/cultural context. Merrill comments on the canonical placement of these books, noting that it “is in keeping with the notion propounded in this work that the major objective of the Chronicler was to provide a theological interpretation of Israel’s past interlaced with great hope for an eschatological renewal of the Davidic house, one bound to Yahweh its God by an indissoluble new covenant” (46). He dedicates several pages to the historiographical issues in Chronicles and addresses, among others, the problem of differences between Chronicles and the “Deuteronomic History.” Merrill also provides an introduction to text-critical issues of Chronicles, and these are noted throughout the commentary proper. Another notable section of the introduction is the one on the theology of the book; here, Merrill provides overviews of the house of David, the renewed covenant, and the restored temple. Each section of the commentary proper begins with the text in the NIV, a few key text-critical notes (from the ones I looked at, they are what you can get from the BHS critical apparatus), and then a brief exposition. Most of the notes I read were exposition rather than exegesis; there is a lot of summarization and provision of context and less exegetical work. Most of the treatments are rather brief, with commentary taking up about the same amount of space as the translation (if the English text had not been included I would guess that this volume would only be about 1/3 the length!). Scattered throughout the commentary are twelve brief excurses addressing topics such as the Angel of YHWH, Holy War, and OT historiography, as well as nine theological discourses addressing the theology of the genealogies, the rise of David, the exploits of David, the royal succession, Solomon’s temple, as well as the divided kingdom. This is a good conservative commentary for your typical person-in-the-pew as well as for preachers. I think one of its unique strengths is its attention to theology; this comes out in the introduction, commentary proper, as well as theological discourses. Unlike other volumes in the series that have homiletical helps, Merrill’s is less attuned to application. A major weakness for me is that this commentary is not as exegetical as I would have expected based on the fact that it’s in an exegetical series. The commentary sections are also often quite brief. Seminarians will definitely (and perhaps preachers as well!) need more technical and robust commentaries on 1 and 2 Chronicles. No God But One: Allah or Jesus? A Former Muslim Investigates the Evidence for Islam & Christianity is Nabeel Qureshi’s follow-up to his NYT Bestseller Seeking Allah, Finding Jesus: A Devout Muslim Encounters Christianity. Qureshi contrasts these two books by describing Seeking Allah, Finding Jesus as the heart of the story and No God But One the mind of his story; whereas the former is largely a testimony, the latter is a tremendous apologetic resource. No God But One is a fantastic book to help Christians understand the core tenets of Islam and the foundational differences between Islam and Christianity. As such, it’s both a must-read for Christians seeking to grow in their understanding of Islam and their ability to engage their Muslim friends in spiritual conversation, as well as for Muslims who are questioning their faith and asking questions about Christianity. As a former Muslim, Qureshi has a rare insider’s perspective. As an apologist on the Ravi Zacharias International Ministries speaking team and a New Testament Ph.D. candidate at Oxford University, he is well-equipped with first-rate training on the subject matters pertinent to No God But One. These two factors combine to make the book a superb resource on the differences between Islam and Christianity. The arguments are robustly defended and winsomely presented, and Qureshi’s passion for the gospel and for his kinsmen according to the flesh to come to saving knowledge of Jesus Christ is pervasive throughout the book. This really is a book that every Christian with a passion for evangelism/apologetics should read, but especially those with a burden to see Muslims come to faith. Zondervan and the No God But One publicity team have sent me a number of copies to give away, and I’m excited to give away three copies on my blog. Instead of running one giveaway and selecting three winners, I’m going to run three separate giveaways in succession. Whenever I post announcing a winner, that post will also be the way to enter the subsequent giveaway. I will also post a full review with the last giveaway. The book officially releases on August 30. Check out the website for an overview about the book, quotes, a video, as well as some sweet preorder offers. ***Giveaway is now closed and winners will be announced shortly. Each of the following gets an entry, just comment saying you did it (comment separately for each method for them to count as separate entries). This first giveaway will close this Friday at noon EST, at which time I will choose a winner from the comments using a random number generator. Giveaway open to residents of the contiguous US. Thanks to Zondervan for the Advance Reader Copy and giveaway copies! Craig S. Keener and John H. Walton, ed. NIV Cultural Backgrounds Study Bible: Bringing to Life the Ancient World of Scripture. Grand Rapids, MI: Zondervan Academic, 2016. 2400 pp. $49.99. Prolific OT scholar Dr. John Walton and NT scholar Dr. Craig Keener have teamed up to bring us a new study Bible that illuminates the cultural, historical, and literary context of the Scriptures. Not only are Walton and Keener experts in OT and NT studies, respectively, but they are especially known for their research in backgrounds (as can be seen, for example, in the two-volume IVP Bible Background Commentary they edited). With the NIV Cultural Backgrounds Study Bible, the kind of information that could previously only be found in massive dictionaries/encyclopedias or specialized monographs has been made accessible to the person in the pew in a stunning study Bible that uses the most popular and trusted modern translation. While this study Bible contains many of the elements shared by most study Bibles (e.g. book introductions, maps, charts, photographs, study notes, etc. ), here everything is distinctly focused on context and background (social, political, cultural, historical, literary). For example, at the beginning there is a chart that provides explanation and select key verses of key Hebrew words that have no exact equivalent in English and an article explicating major background issues from the ancient Near East. Before the New Testament text there’s a section on “Key New Testament Terms” that clarifies cultural concepts behind key terms. In this section not only terms in the NT itself are defined (e.g. Christ, law, Satan, etc.) but also terms from the Jewish (e.g. Dead Sea Scrolls, Qumran community, Maccabees, etc.) and Greco-Roman backgrounds of the NT (e.g. client, Cynic, etc.). Some interesting background insights include the note for 6:29c-d (“If someone takes your coat, do not withhold your shirt from them”), where we are told that the coat is “[t]he one possession that a creditor could not legally seize from a debtor” (1755), and the note for 9:60 (where Jesus responded to a man who asked to bury his father before following Jesus, “Let the dead bury their own dead, but you go and proclaim the kingdom of God”) tells us that “burying one’s father was one of society’s greatest obligations” (1766). Both of these background notes give us deeper insight into what Jesus is saying about discipleship. The note at 18:25 debunks the commonly preached erroneous insight that there was a gate in first century Jerusalem called “Needle’s Eye” (saying this drastically lessens the force of the point Jesus was making). Regarding the tearing of the temple in 23:45, in addition to the commonly preached insight about the tearing of the curtain perhaps signifying new access to the Holy Place we are told that it “probably implies the departure of God’s presence from the temple, prefiguring its destruction” (1797-98). The NIV Cultural Backgrounds Study Bible will help the serious Bible student who does not have advanced knowledge of the worlds of the biblical text enter those worlds. Key background and contextual insights will open up new riches of spiritual and theological understanding that will also have practical implications for the Christian life. This study Bible is a great one-stop-shop on cultural, historical, and literary backgrounds to the Bible. Find out more about the NIV Cultural Backgrounds Study Bible here! Thanks to Zondervan Academic and AcademicPS for the review copy! Joseph H. Hellerman. Philippians (Exegetical Guide to the Greek New Testament). Nashville, TN: B&H Academic, 2015. 368 pp. $29.99. Though B&H Academic’s Exegetical Guide to the Greek New Testament (EGGNT) is a fairly new series with only 5 volumes released so far out of a projected 20, it has already established itself as an essential resource for seminary students, pastors, and biblical scholars alike. Written and edited by some of the finest Evangelical New Testament scholars of our day, these volumes are crucial supplements to conventional commentaries for those who have a working knowledge of Koine Greek and desire to exegete the Greek NT text. During my Greek Exegesis courses (Colossians & Philemon and 1 Peter) last year I always consulted the EGGNT after doing my own work in the text and consistently found my understanding of what’s going on grammatically and syntactically to be enriched by these exegetical guides. One of the newest volumes in the series is Philippians by Joseph H. Hellerman (pastor and professor of NT language and literature at Talbot School of Theology, Biola University). Like the rest of the volumes in the series (and unlike typical commentaries), the introduction is just a few pages and provides a very brief summary of basic introductory issues such as authorship, provenance, occasion, etc. In keeping with the aim of the series to bridge the gap between the Greek text and the available tools, the introduction of these volumes also addresses important grammatical features of the respective NT books when present (e.g. the introduction to the volume on 1 Peter addresses the imperatives and imperatival participles; the introduction for the present volume on Philippians addresses time and aktionsart in the Greek verb). The EGGNT is designed to do what commentaries do not accomplish (provide robust exegesis of the Greek text), not duplicate what can be found in any good commentary. These volumes also provide recommended commentaries at the beginning and an exegetical outline in the end. Each section of exegesis of the Greek text begins with a basic sentence diagram and concludes with recommended resources for further study as well as homiletical suggestions, providing valuable aids for both study and preaching. A look at how Hellerman handles one of the most beloved (and most academically debated?) passages of Philippians, the Christ-hymn, will provide a good windown into his perspective. Interestingly, Hellerman argues that Paul’s argument here is primarily sociological and not ontological, i.e. less about Christ’s divine nature and more about Christ as a model for relationships among members of the Philippian church. While Hellerman believes it likely that Paul composed Philippians 2:6-11 himself, he explains why nothing is at stake exegetically even if the text is a pre-Pauline hymn. His expertise in Roman history also comes out as he illuminates the cursus ideology that was central to the cultural values and social codes of Philippi as well as expressions of honor/shame found in the Christ-hymn. All of this enlightening and perhaps less well-known background information is contained in a robust introduction to the section. Regarding verse 5, Hellerman summarizes the arguments for the two main interpretations of ὃ καὶ ἐν Χριστῷ Ἰησοῦ (Christ’s mind-set in the incarnation and crucifixion versus the believer’s mind-set in union with Christ); while affirming the difficulty of the decision and the maintenance of Paul’s paraenetic aims on either reading, Hellerman prefers the former with some reservations. He takes ἐν μορφῇ θεοῦ in verse 6 as referring to Christ’s preincarnate “social status”; while he has no problem with a secondary argument for the deity of Christ from this clause, Hellerman believes that making this theological corollary primary underemphasizes the sociological thrust of Paul’s argument. He argues for taking the following ὑπάρχων concessively, noting why its preferable to a causal interpretation (espoused by, e.g., O’Brien). Similarly to his argument for μορφῇ θεοῦ, Hellerman contends that εἶναι ἴσα θεῷ should not primarily be taken ontologically. Pertaining to the controversial doctrine of kenosis derived from verse 7, Hellerman notes that it is erroneous to assume that ἐκένωσεν needs a modifier; rather, he contends that the ensuing participial modifiers demonstrate that ἐκένωσεν “is intended metaphorically to signify a lowering of rank (vis-à-vis v.6) by means of the incarnation” (114). In verse 8 Hellerman notes that “humiliated” is a better translation that “humbled” for ἐταπείνωσεν because the latter denotes an attitude or state of mind, whereas the former signifies action performed in a social context with social implications. He argues for reading τὸ ὄνομα τὸ ὑπὲρ πᾶν ὄνομα in verse 9 as referring to public acclaim rather than the name of YHWH. Though I mainly highlighted some of Hellerman’s notable exegetical conclusions and decisions, he provides robust word studies and grammatical/syntactical analysis. Like the other volumes in the series, on points of debate the arguments for every side are presented fairly before Hellerman offers his own conclusion. One unique aspect of this volume is the emphasis on the sociocultural background of the Epistle to the Philippians. I have gained much insight that opened up greater depths to my understanding of certain texts, but there are also areas where Hellerman’s arguments initially made me uncomfortable (e.g. the Philippian Christ-hymn). Hellerman argues for a sociological interpretation for many of the elements in which I saw a primarily ontological argument, and I feel a bit like one of the pillars of the early high/divine-identity Christology argument is crumbling! So, in addition to looking forward to exegeting through Philippians with Hellerman’s exegetical guide, I feel I need to study the Christ-hymn again! 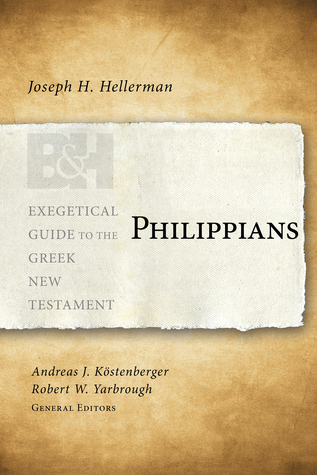 Joseph Hellerman’s Philippians (Exegetical Guide on the Greek New Testament) is an essential resource for students of Greek exegesis as well as teachers and pastors who work from the Greek text.